“By any measure Senator #Hollings led one of the most incredible and consequential lives of any member of the Greatest Generation,” Republican Sen. Lindsey Graham said Saturday on Twitter. “As the junior senator from South Carolina, he welcomed me to the Senate and helped me get established. “And until his dying day, #FritzHollings was always advocating and urging for policies that would make our country strong,” Graham continued. South Carolina GOP Gov. Henry McMaster on Twitter called Hollings “Fierce, bold, and robust.” The late senator also served a term as governor, from 1959 to 1963. “From his service as a soldier in World War II, a state legislator, Lieutenant Governor, Governor, and U.S. Senator, Fritz Hollings was a true statesman who exemplified character, courage, integrity, and honor,” Cunningham said in a statement. An accomplished debater, Hollings was known for using historical anecdotes and humor to drive home his points. “In an age when politicians consult opinion polls before uttering a word, Hollings says what’s on his mind,” a 2003 CQ profile reads. Hollings was a prominent player in most other important policy debates of his era, including civil rights, arms control, the defense buildup of the 1980s and the defense retrenchment of the 1990s. He helped create many of the seminal environmental laws of the 1970s, and he was instrumental in the creation of the National Oceanic and Atmospheric Administration. Modern times, including the 9/11 terror attacks, brought new issues to the fore, but Hollings continued to appeal to a cross-section of voters in what had become a mostly Republican state. 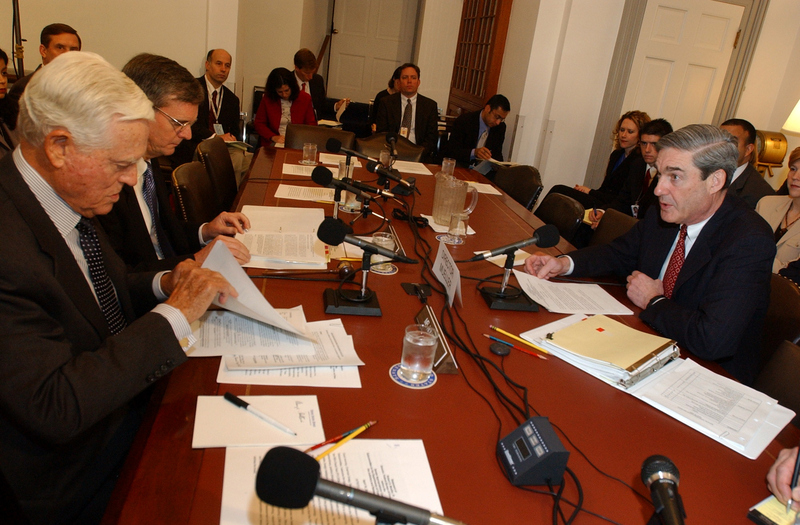 Then-FBI Director Robert Mueller, right, makes a statement at a Senate Appropriations subcommittee hearing with Hollings, left, and Sen. Judd Gregg, R-N.H., in the Capitol (CQ Roll Call file photo). Hollings was born in Charleston in 1922 to the owner of a dry goods store who lost everything during the Great Depression. He attended public schools and graduated from The Citadel before attending law school at the University of South Carolina. He served as a captain in the Army in World War II from 1942 to 1945 and was awarded a Bronze Star. In 1948, at age 26, Hollings won election to the South Carolina House. A decade later, he was elected governor. Hollings espoused states’ rights in his run for governor and condemned school integration, but after his election, he quietly integrated the state’s schools. He helped John F. Kennedy carry South Carolina in the 1960 presidential campaign as well as six other Southern states. Then-Gov. 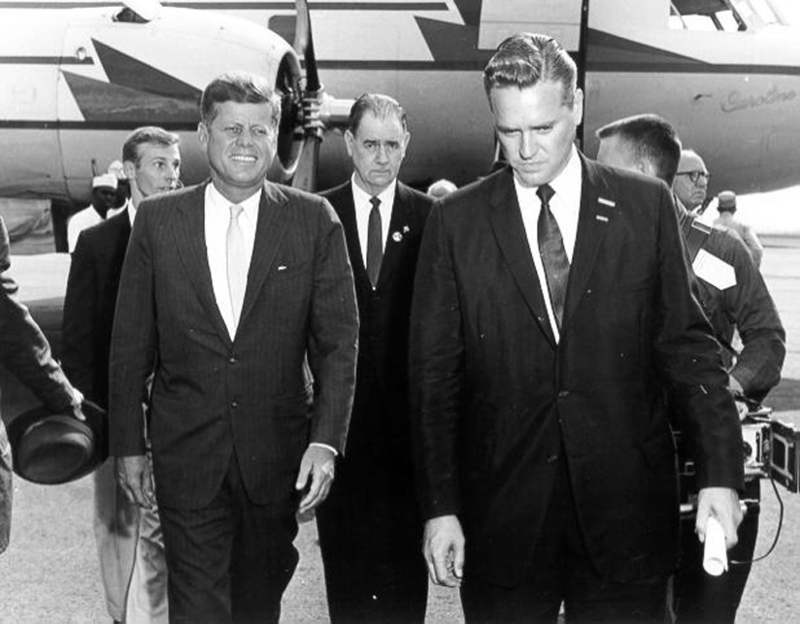 Hollings escorts John F. Kennedy during the 1960 presidential campaign. In 1962, Hollings challenged Democratic Sen. Olin D. Johnston in a primary and lost. Johnston died three years later, and Hollings narrowly won a 1966 special election for the remaining two years of his term. He won a full term two years later and rolled over weak opponents in 1974, 1980 and 1986. In 1992, former GOP Rep. Thomas F. Hartnett challenged Hollings and portrayed him as an arrogant, entrenched incumbent, but Hollings won that race with 50 percent of the vote — 3 points ahead of Hartnett. Hollings prevailed by 7 points. Hollings was also a friend to former Vice President and Delaware Democratic Sen. Joe Biden. He advised Biden in South Carolina during his 2008 presidential bid. Tributes to the late senator rolled in Saturday as news of his death spread. Sen. Hollings dedicated his life in service to his state & his country. Whether he was serving his country as an artillery officer during WWII, or fighting on behalf of his constituents in the halls of the US Senate, Senator Hollings was the embodiment of a true public servant. Senator Fritz Hollings’ love and affection for the people of South Carolina was so clearly proven during his time as Governor by his promotion of technical education to lift citizens from poverty. In the Senate, he tirelessly fought for the reduction of hunger for all South Carolinians. Roxanne and I express our deepest sympathy to the Hollings family for the Senator’s lifetime of service. Today I am saddened by the loss of a great friend, Senator Fritz Hollings, who represented SC in the Senate for nearly four decades. He was a former governor, presidential candidate, distinguished Citadel graduate, and Commerce Committee Chairman. Annette & I mourn his passing.